My niece came to visit for a week and last Monday (March 26th) we decided to head into the city and go see a movie. We didn't get more than 15 minutes past the farm and my phone rang, I answered it (with my handsfree head-set of course) and Luke spits out "....Tansy just had two babies.....they are walking around...trying to get out of the pasture.....baby lambs"
We turned the car around and in 15 minutes I was face to face with two beautiful, SURPRISE lambs. 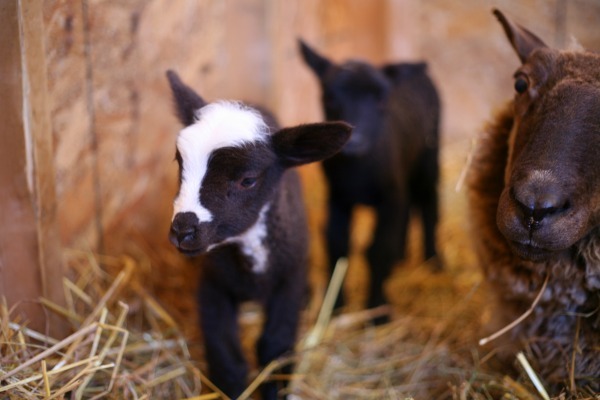 A sweet little ram lamb and a ewe lamb with one adorable white 'sock' and lovely white face markings. We are trying to figure out how she got pregnant, because we didn't move our ewes in with the rams until mid-December (gestation is only 5 months, so she got pregnant around October 25th). Perhaps it was the young ram lambs that we didn't move out of the pasture until late October. Rams can start reproducing as early as 5 months, but my wise farming mentors suggested I move them by 4 months of age (oops I didn't listen very well). Maybe it was through the fence - I've also heard many stories of how an eager ram can make that happen. Either way we are on high alert of any more early pregnancies. It's colder than I was expecting to have to deal with lambs, but we moved a heat lamp into the lambing jug, and mama Tansy is a great mom, so lots of good colostrum and milk to her lambs and they are growing stronger and bigger everyday! The boy will not stay with us once he is weaned, we cannot have any more boys on the farm, so if you are hoping to start a "sherino" flock let us know (cross of Merino and Shetland). The boy has been named spot in the meantime for the little tuft of white on top of his head, and the girl has been named Odessa, but we call her Odie for short. It is making me more excited for all the lambs to show up.....just hopefully not until the middle of May!